As Brexit uncertainty continues to unsettle confidence among clients in the private sector, the industry is becoming increasingly reliant on public spending. The construction industry’s biggest three clients in 2018 were the departments of transport, health and education according to Glenigan’s market analysis. The Department of Transport topped Glenigan’s ranking of the industry’s top 100 clients in 2017 and retained that position last year. The DoT let a similar amount of contracts, but these deals were generally smaller in value as overall spending sank by 37%. In contrast, the 285 contracts awarded by Department of Health in 2018 was 15% more than a year earlier but these deals were for larger construction projects, and overall spending leapt 54%. 018, those three government departments alone were responsible for letting £5.2 billion-worth of construction contracts. That total is broadly unchanged on the previous year but as commercial spending has dwindled, state spending is becoming more important. In 2018, 25% of all spending by the industry’s leading 100 clients came just from those three government departments. As commercial spending is hit by continuing economic uncertainties including Brexit, leading developers are spending less. As a result they are sliding down Glenigan’s ranking of the industry’s top 100 clients - and being overtaken by government departments. Excluding regulated bodies such as Network Rail and Homes England, there were eight government bodies in the top 100 clients in 2018. In 2017, there were six. In 2018, the Department for Regional Development in Northern Ireland, the Ministry of Justice, the Environment Agency and the Home Office also featured in Glenigan’s top 100 clients table. Spending at the Ministry of Defence shrank 59% last year. Contract awards at the Environment Agency and Home Office also reduced but there was a 144% surge at the Ministry of Justice as new prison projects were procured. 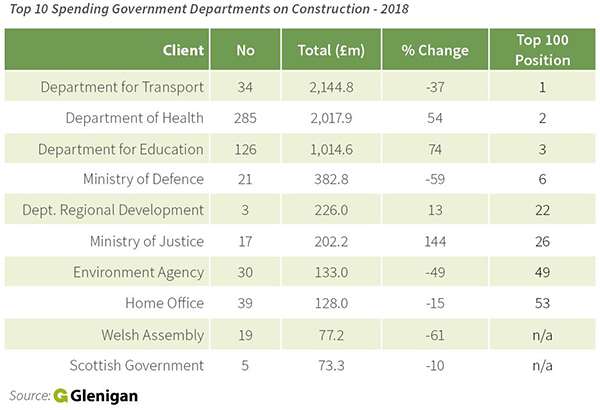 The devolved governments in Wales and Scotland had previously featured among the top 100 clients, but construction spending shrank by 61% and 10% respectively last year according to Glenigan’s contracts data. The Welsh Assembly and the Scottish Government are however still amongst the top 10 state controlled construction clients in the United Kingdom. The total construction spending by those eight government departments ranked in the top 100 last year, totaled £6.2 billion, which is 30% of all spending by the top 100 clients. Construction spend by the six government departments in the top 100 in 2017 was just under £6.6 billion. So spending by the main government departments has dropped 5%, but private sector spending is falling at a faster rate. This makes the state’s construction spend more important. In 2017, the government departments in the top 100 were responsible for 19% of total spending. Last year, that ratio was 30%. Given the ongoing economic uncertainties that ratio could rise further.